Well, as happy as you can get about this week. I’m still sending warm, fuzzy sangria and tapas thoughts out to all mi amigos in Barcelona. One of the world’s great cities, and if I could transport myself Star Trek style I’d be trekking down Las Ramblas in solidarity with my Spanish friends this very evening. Instead, I’ll knock back an Estrella later and dream of Gaudi buildings. In the meantime, the cyber world moves on, and Politico reported some interesting news earlier today out of the Trump Administration. President Trump announced today that U.S. Cyber Command has now been elevated to a "Unified Combatant Command," putting it on equal footing with other organizations that oversee military ops in the Middle East, Europe, and the Pacific. "This new Unified Combatant Command will strengthen our cyberspace operations and create more opportunities to improve our Nation’s defense. The elevation of United States Cyber Command demonstrates our increased resolve against cyberspace threats and will help reassure our allies and partners and deter our adversaries." TechCrunch elaborated in its own coverage that "whatever happens" with this change, it will be "welcomed by many" and that "there is a sense that we are being outplayed by cyber operatives in countries and organizations all over the world, from Russia to IS." I did some more roaming around the IBM Industry Summit Expo this past Thursday afternoon just as the action there started to wind down, and I seguewayed from trying to better understand smarter video analytics to that of smarter city operations. If you’ve seen the IBM TV commercials, you’ve seen our experts talk about the opportunities to make cities smarter around the world. Well, IBM Smarter City expert, Mike Kehoe, provides a 5-minute video helicopter ride in the video below over what a typical smarter cities operation might look like. …Oh yeah, and for the five minutes I interviewed Mike, he made me the honorary mayor of Barcelona! Jon Iwata, IBM senior vice president of marketing and communications, visited the Barcelona IBM Industry Summit stage this morning with a little bit of Alice in Wonderland in tow: In order to understand how we were moving forward, Jon invited the audience to first take a glance back. 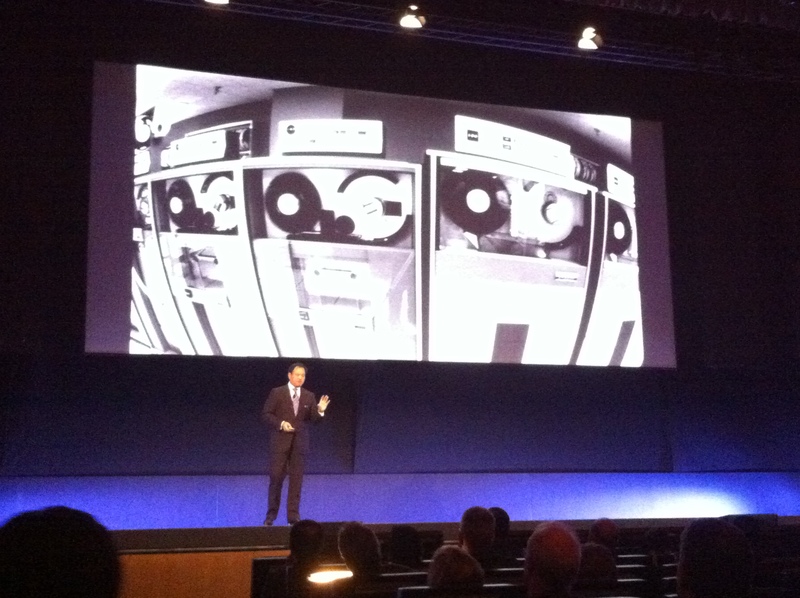 Jon Iwata, IBM Senior Vice President, Marketing and Communications, uses an image of the IBM System/360 as an object lesson as he explains how IBM is "making new markets" with its Smarter Planet agenda. In a very matter of fact way, Iwata observed that it’s not very often one’s industry moves to an entirely different realm, but that when it does, it presents a unique opportunity for an organization to make new markets. By way of example, Iwata explained that IBM will be turning 100 next year, celebrating its centennial as an ongoing business concern, and that it has made markets numerous times in its past. It’s also missed opportunities to make them. But by reminding ourselves of these moments, Iwata suggested, we start to see a pattern, one in which emergent technology plays a role often so powerful that new clients don’t quite know what to do with it. In those circumstances, it’s important that we not only introduce new products and services, but also that we identify a new kind of client or buyer, possibly even a new vocabulary. At these moments of inflection, however, it has not always been in IBM’s interest to embrace the new. Arguably, Iwata explained, the first market IBM ever made, made IBM: The Hollerith tabulation machine. But further innovation didn’t come when we tried to outsmart the competition, in this case Remington Rand, to try and counter their 90 hole punch card. No, it was embracing vacuum tubes (which could compute faster than punch cards) and, later, the recording tape (which, in 1947, delivered the first recorded radio broadcast). As Iwata explained, a whole room full of engineers in Poughkeepsie wondered whether that recorded audiotape could also serve as a new way of storing information — soon, an entire new inflection point was created. Good thing, too: IBM customer New York Central Railway was punching 75,000 punch cards a day, and devoting entire floors of their Manhattan offices to storing those cards. An IBM executive dropped by the Poughkeepsie office, saw the hullabaloo regarding the recording tape, and said “Interesting technology…but don’t forget the IBM company was built on punchcards.” (At the time, IBM derived one-third of its revenues from punchcards). Yes, a good business…but still an inflection point. Even with the new magnetic storage technology, IBM had to make the market. That meant change, and not always change that was welcomed by customers (“We could see the data with the punchcards, but not with tape!”). New technology, new applications, change the market. Flash forward a few more years: A press conference presided over by then IBM CEO Thomas Watson, Jr.: The announcement of the System/360. This was a bet-the-company move: $2B in R&D ($34B in today’s dollars), the first 8-bit byte, six processors in a family, 54 different peripheral devices. IBM took 1,000 orders in the first month, and sold several thousand more the following months: But it took five years to ramp up to meet customer demand in volume. Make the market. But in so doing, cannibalize virtually all of IBM’s existing product lines. Later that decade, clients embraced radical new concepts like “online transaction processing,” and IBM technology even helped send men to the moon to allow both computing, and mankind, to go places neither could have gone before. But at the time, it wasn’t obvious. It was a market in the making. Iwata explained, now flashing forward to the fall of 2008, another inflection point. In the Smarter Planet agenda, we saw a similar pattern. Despite the market fallout two years ago, we’ve witnessed a continued explosion in technology, much of it even now disposable, and with that an explosion of data in form, type, and speed. New workloads, new applications — we had to develop a different vocabulary to be able to explain it both to ourselves, and to our customers. Two years ago, we set out to make a new market, one that would open opportunities for IBM, our partners, and our customers. We set out to modernize the understanding of IBM’s differentiation, to demonstrate IBM’s relevance to what people cared about, to take a leadership stance at a time the world was calling out for it. When that global financial crisis hit, we hit pause, briefly, waiting for the next Great Depression…Panic…Uncertainty…All heading into a presidential election. But as the fallout of the crisis settled in, IBM CEO Sam Palmisano hit “play” and introduced the ideas behind what drives a smarter planet at a speech before the Council on Foreign Relations. That was two years ago this week. It wasn’t introducing a new marketing campaign, explained Iwata. 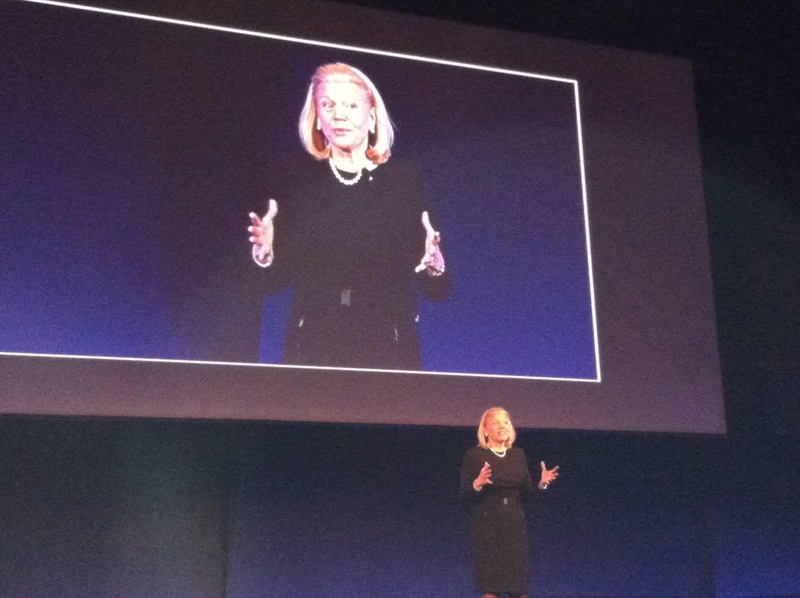 IBM was initiating a conversation with the world to forge a shared belief. What do you need to believe something, Iwata asked the audience in Barcelona? Facts. Data. Evidence. In Palmisano’s speech, the word “IBM” never appeared once. In the advertisements and editorials that began to emerge as part of the campaign, the focus was on the evidence, the data, the proof of the gathering storm that indicated the new market was emerging, but it was one represented not by IBM-speak, but rather by business-changing facts emblematic of what IBM customers were doing to improve their businesses and, in turn, the world. The results: Two years later, 85% of IBM clients would consider IBM as a key partner having had prior knowledge of the smarter planet agenda. Yes, it creates a more favorable selling environment, conceded Iwata. But as IBM enters the third year of making this new market, even our friends at Gartner suggest that the smarter planet agenda is doing something more, is enabling IBM to stake a claim to a significant role in business and societal transformation. Now, we’re providing client and partner references with hard facts, and lessons learned. We’re helping clients understand the “how to’s” of building smarter systems. We’re developing clearer paths to value, and we’re focused on quantifying outcomes, often via industry-specific measures. We’re building progressive paths to provide clear roadmaps and to help partners chart outcomes and quantified value for their clients. And we’re showcasing some of our most progressive clients, as well as using the social, digital eminence of IBM experts (by industry, technology, and so on) to reach out and demonstrate that value and make those experts accessible to the marketplace. We’re making a new market, admittedly…but we’re trying to build a better world in the process. I arrived here Sunday morning, expecting the worst in traffic due to Pope Benedict’s visit, but was pleasantly surprised, able to quickly arrive go from the airport to my hotel near the Palau de Congressos de Catalunya, the location for this week’s IBM Industry Summit here. Though I didn’t have the opportunity to witness the Pope in person, Spanish TV carried extensive coverage of his consecration of Antoni Gaudi’s Sagrada Familia, and I certainly was able to see the aftermath near the Museu Picasso later in the day as traffic was blocked to ensure the Pope’s motorcade had the run of the city. There was a lot going a lot going on this weekend in Spain. Elsewhere, in Madrid, “Desperate Housewive’s” (and Corpus Christi, Texan) Eva Longoria hosted the MTV Europe Music Awards, where noshow Lady Gaga (she was performing elsewhere, in Budapest) took the top honors for Best Pop, Best Female, and Best Song (for “Bad Romance”). Speaking of bad romance, if you’re a Dallas Cowboys football fan, the romance between fans and team this season is definitely over (while I was sleeping, they lost to Green Bay 45-7). I had already mentioned that, fair weather fan that I am, I was in the market for a new football team. If it weren’t for alienating mi amigos in Madrid, I might say I’d found one in La Liga, the Spanish soccer league, where Barca beat Getafe 3-1 last night. Instead of taking sides and possibly instigating an intra-IBM futbol conflagration, however, let me be the eternal diplomat I am and let me just say I love ALL European football — if for no other reason than the fact that none of it involves the Dallas Cowboys. Like football teams everywhere, just about all great artists have their blue periods, and it was Pablo Picasso who defined them. This is my second time in Barcelona, but somehow I missed the Picasso museum my first time here. I won’t make mistake again. Though I’m no Picasso scholar, if you’re looking for a one-stop-shop venue to learn more about the artist and his evolution, this is the place. I visit museums whenever and wherever I can in my travels, and Museu Picasso was up there on the list. In fact, Picasso’s Velazquez-inspired “Las Meninas” alone was worth the price of admission — in my case, free (but only on the first Sunday of the month after 3 PM!) — as the video presentation outside the exhibit demonstrated how Picasso was both paying homage to Velazquez, but through his Cubist tendencies, completely re-envisioning the great work. Finally, and before I segueway in immediate and future postings back to the business at hand, the IBM Industry Summit here, I’ll leave you with this factoid: Did you know that Picasso is the most stolen artist in the world? At last count, the Art Loss Register had 550 of Picasso’s works listed as missing. Most recently, Picasso’s “Dove With Green Peas” was stolen, along with pieces from several other famous artists, in a brash burglary at the Paris Museum of Modern Art this past May. For the record, I was nowhere in the vicinity! Of course, I’m not going to have much of a weekend. I’m heading out on the road again (Sing it, Willie! ), this time to Barcelona, Spain. I’m arriving the same day as the Pope. I don’t think I’ve ever been in the same town as the Pope before, but he’s apparently heading in to consecrate Sagrada Familia, the lovely Gaudi-designed church that’s never been finished (and which I visited in my first trip to Barcelona 10 years ago). Me, I’m on my way to Barcelona to attend the IBM Industry Summit, an invitation-only event that I’ll be covering in the Turbo blog over the course of the next week. The central theme of the event based on my pre-briefings is the unique and vast opportunity for innovation across a wide range of industries moving forward, and the role IBM technology, as well as our industry frameworks and expertise, can play across the gamut of industries IBM serves, from finance to public sector to telecomm and beyond. I’ll be a fly on the industry wall, taking notes and sharing key insights and sound bytes, so be sure to start tuning in early next week, and to also follow the #ibmsym hashtag on Twitter. I’m going to travel lighter than usual this trip. I’ll be carrying along my new HP Pavilion notebook, my iPhone 4, and the iPad. That’s it. If that sounds like a lot, I had my MacBook Pro, a Dell Latitude, the iPad, and the iPhone on that last trip to Information on Demand in Vegas. No matter the tools, look for the posts starting on Monday, and I’ll be sure to keep a look out for your comments…and the Pope.